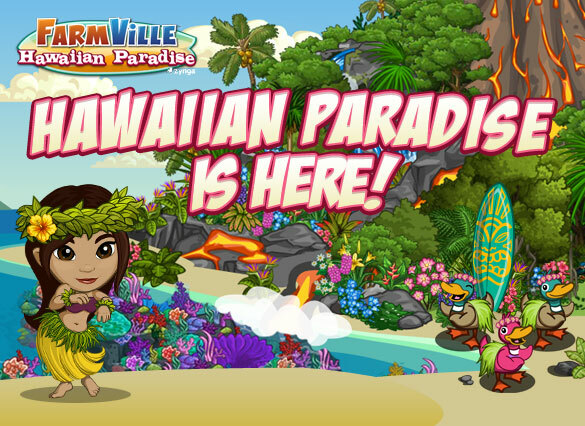 This quest for early access, for the new Welcome to Hawaii Quest (Chapter 2) please go here Welcome to Hawaii Quest Chapter 2. Note: This unreleased may not be accurate or may change. This may only be available to players who avails the early access to the Hawaii Paradise farm extension. So you have to spend a few FV cash to avail the early access pass. FarmVille Tip: You can craft a Poi at the Tiki Bar, it’ll need Taro Bushels x9. FarmVille Tip: You can craft these in the Tiki Bar and will need Yellowfin Tuna Bushels x1,Yellow Hibiscus Bushels x4 and Chick Pea Bushels x2. FarmVille Tip: Place and harvest the Humpback Whale in the Ocean Animal Pen.